The Great Green Goo is No More! April 20, 2012 April 20, 2012 Categories Faith, Family, Forgive, FunnyAsk, Blessing, Carpet, Christianity, Ephesians 3: 20-21, exceedingly above, Faith, funny, God, Gratitude, Jesus, Kids, mom, Paul, Religion and Spirituality, Stain removalLeave a Comment on The Great Green Goo is No More! You know those times when your house is eerily quiet and you sense someone somewhere is up to no good? Well I had one of those occasions 8 years ago and I have the green goo stain in the carpet to prove it. One Sunday afternoon we were all enjoying a relaxing respite from the madness that was and is our busy life . The kids were happy. The birds were singing. The house was sufficiently clean. As I was relishing the moment, I suddenly became oddly aware that the only other sound I could hear was my husband snoring. Not good. I decided to take a field trip upstairs to check on the little munchkins. The littlest one was in the midst of an epic battle between Spiderman and one of his ninja turtles (the purple one I think). I took note of the need to potentially limit his exposure to cartoon violence and proceeded down the hall. A minute later I met a rather guilty looking 7 year old with a sudden case of “green-goo-itis”. Never mind that we live in Florida and it was the middle of summer. I made my sweet offender show me her hands which had a mysterious green glow. I could see remnants of green playdoh/silly putty/goo under her fingernails. Figuring it could be worse; I went back downstairs to start dinner. Not long after, I heard my husband holler. Racing upstairs I saw him glaring at a large green goo stain in the carpet in our bedroom. “Someone” had tried to cover it up with a towel, a box, some leaves and a hair bow. Ha, a dead giveaway as to the culprit, I thought. Of course that was beside the fact that only one person in the house had green goo fingers. When we interrogated the suspect, she denied all knowledge of the incident. She stuck to her story and no amount of pressure, reason, threats or consequences could get her to break. Her vehement denial was unparalleled. So we doled out the appropriate punishment for goo stains and moved the bed over twelve inches. We knew The Great Goo Incident would be remembered for generations to come if for no other reason than it was NOT coming out. Fast forward to this week when I had the carpets cleaned. 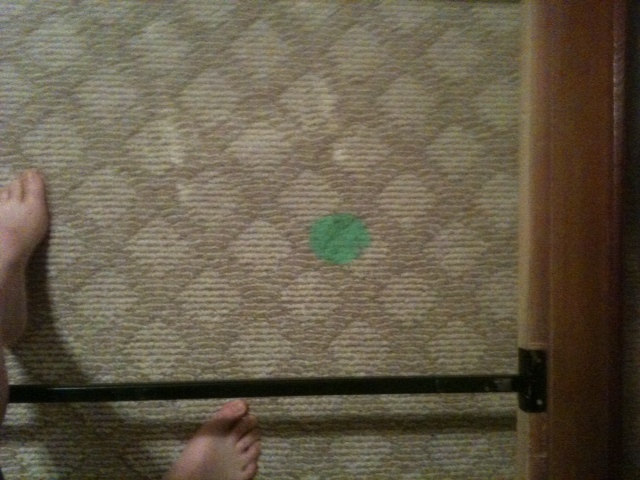 As I walked the guy through the house pointing out rooms and specific stains, I glanced towards the green goo. I figured it couldn’t hurt to ask knowing full well the guy would probably laugh at the request. Nevertheless, I asked. Not 30 minutes later, it was gone. GONE! I have no idea what magical potion he used, but it worked. No more Green Goo! And to think I almost didn’t even say anything about it. And then I was reminded of the passage in Ephesians 3 where Paul describes God as able to do exceedingly abundantly above all that we ask or think. There is an “inexhaustible fullness of grace and mercy in God” (Matthew Henry’s Commentary) which we cannot comprehend. Whatever we may ask, or think to ask, God is still able to do more – way more! What will you ask Him to do for you or through you today? Ask and then watch as circumstances change, opportunities open up and God shows you something exceedingly abundantly above anything you ever imagined. Previous Post A Black Eye From What?